1/2 garlic bulb (about 4 cloves sliced). About 3 parts of cornmeal to 1 part cheese in a wide bowl with a flat bottom. Whip the batter with a fork until fully mixed in a small, steep-sided bowl. Heat a large frying pan with about 1/4" of olive oil covering the bottom on medium high. 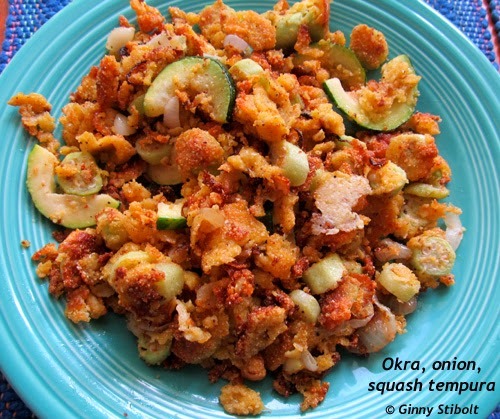 Drop about 1/4th of the vegetables in the batter, lift them with a slotted spoon, and then dredge in the dry mixture until coated. Spread the vegetables in the pan and turn after a few minutes. When first batch is light brown, slide it to the side of the pan away from the heat before adding the next batch of vegetables. When the second batch is light brown, turn over the first batch and slide all of them to the cool side of the pan and repeat for each batch. 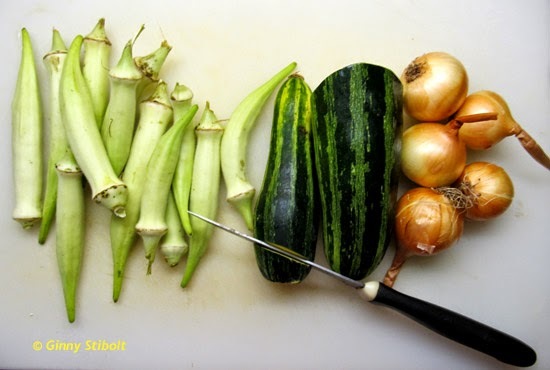 After all the veggies are done, lift them out with the slotted spoon and drain on a double layer of paper towels on a plate and turn after a couple of minutes. Serve with soy sauce. Crop-based tempura. It was yummy. My Swiss chard looked like Swiss cheese! 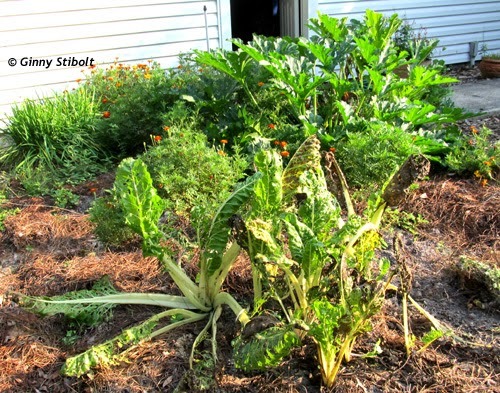 The Swiss chard had gone by and was being eaten by bugs or slugs. 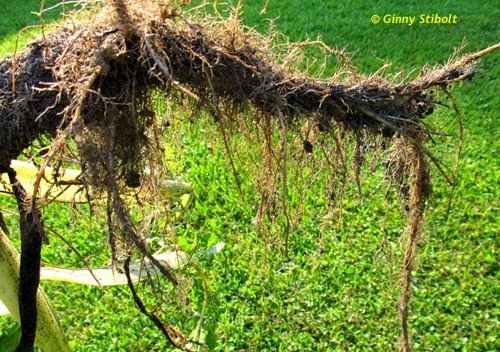 Chard is a beet and has a good tap root. I checked them for nematode damage and there was none. It was time to take action to extend the Swiss chard season. Some of the chard plants were really large with stems that were 2" across, but I chose 7 smaller plants and put them into a pot. This way I can remove them from their hot, sunny location to one with more shade and also remove them from those hungry herbivores. 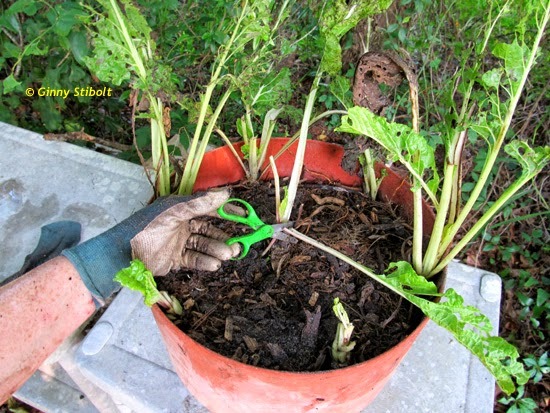 Chard is a beet that has been bred for foliage and not the root, but that meaty tap root will provide the energy for regrowth for a few more harvests. I harvested the leaves that had not turned brown and rinsed them well before bringing them inside. They are holey, but that won't matter once they are finely chopped for salads or cooked for greens. Stay tuned and I'll let you know how they grow. I trimmed away all the leaves and soaked the pot in rain barrel water overnight. 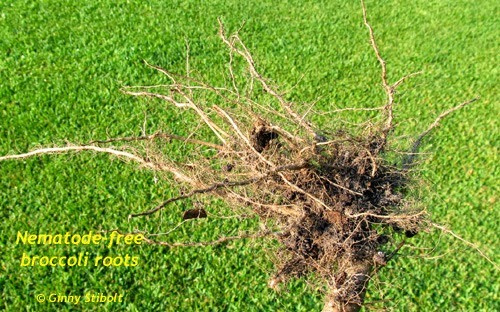 Someone asked for a better photo of the roots, so here's a closeup of nematode-free broccoli roots. I found out about using marigolds as a cover crop during a discussion with several UF professors when doing my research for "Organic Methods for Vegetable Gardening in Florida." There is a whole group working on organic agricultural practices and they were quite generous with their time as we were writing the book. Here is the article on cover crops: Cover Crops for Managing Root-Knot Nematodes, and more specifically, Marigolds (Tagetes spp.) for Nematode Management. One of the commenters said that it didn't make sense to him that if inter-cropping (planting together) didn't work to reduce nematodes, then how could growing marigolds for two months before planting be effective. What he missed in reading the article was that, by definition, a cover crop is dug under after growing. I learned from the professors is that most of the nematode repellent chemicals are in the leaves, so the marigolds work only when used as a cover crop and dug in before planting the next crop. It was an interesting discussion and several people said that they learned a lot, which makes me feels good. A dark force lurks over the pollinators working the coreopsis. 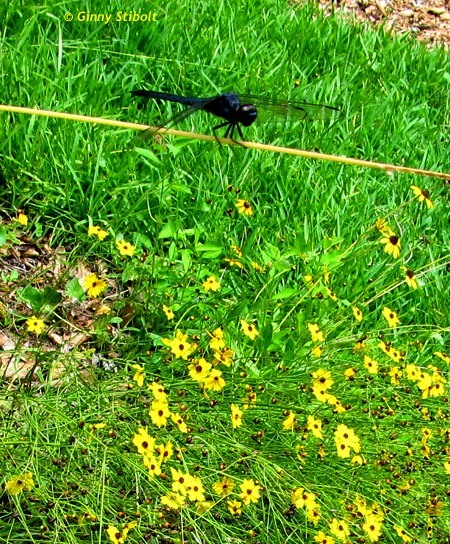 The large dragonfly is probably a black pond hawk (Erythemis attala). 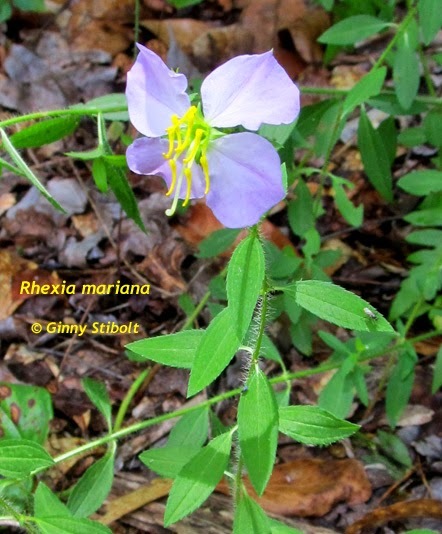 Pale meadowbeauty lives up to its name. Summertime in Florida means great cloud formations. They were interesting in every direction on June 24th. The summer skies in Florida can be amazing. Be sure to look up!